Chester and Gretel venture out in colder temperatures than most small dogs do. Or, at least, they are outside in cold temperatures longer than most dogs. Our average winter hike is in snow, at 25-30o F temps, and 3-4 hours long. I’ve never had a serious problem with Chester and Gretel in the many years we’ve been braving the elements. However, I would be lying if I said they never got cold. When we’re moving on the trail, they seem oblivious to the cold. They have jackets on and their body stays warm from the movement. Because of the way a dog’s feet work, their paws stay pretty warm too. As soon as we stop though, they start to cool off. They’ll start to shiver a bit right away. Honestly, I don’t think a little shivering is a big deal. In my experience, all small, short-coated dogs shiver when the air is crisp. I think, like me, their skin is conditioned to the warmth of our house so even a slight cold breeze will give them the chills. It’s not dangerous or torturous to them (although they might try to convince you otherwise). It’s just a natural physical reaction. However, there is a possibility that they could get too cold. If they do, they could get hypothermia… which is bad. It’s something I watch for closely. Sounds super scary, right? It is. Hypothermia is no joke. And small dogs are more susceptible to getting it than larger dogs because it’s harder for them to generate their own body heat. WARNING: I AM NOT A VETERINARIAN. WHAT I’M SHARING HERE IS BASED SOLELY ON MY RESEARCH, MY EXPERIENCE WITH CHESTER AND GRETEL, WHAT I LEARNED ABOUT HYPOTHERMIA IN MY PET FIRST AID CLASS, AND WHAT I LEARNED ABOUT TREATING HYPOTHERMIA IN HUMANS DURING MY MOUNTAIN ORIENTED FIRST AID CLASS. MY GOAL IS TO GET YOU THINKING ABOUT THE ISSUE AND TO AT LEAST INFORM YOU A LITTLE. PLEASE TALK TO YOUR VETERINARIAN ABOUT RISKS AND TREATMENTS. How Do I Know If My Dog Has Hypothermia? As long as you are aware hypothermia is a possibility, and watch for the early warning signs, you will know when it’s too cold and you should call it a day. Frankly, knowing how to spot the signs something is wrong starts in the comfort of your own home. You should have a basic idea of how many breaths your dog takes a minute. You should also know where to find their pulse (hint: the groin area – take a class or find pictures online if you don’t already know) and what normal is for them. Once you know those things, you’ll have a baseline to compare things to when out hiking. You should never get here but I’m listing the symptoms just in case. 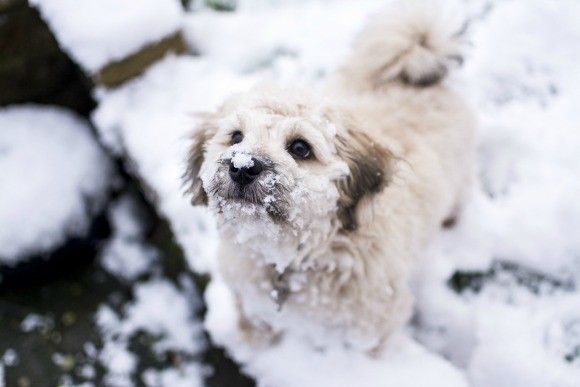 It may not seem like it, but going out in the cold is always risky – both for humans and pets. Heck, living is risky. The key to life is mitigating the risks. It’s no different with hypothermia. Just know the risk, know what the signs are, pay keen attention to your dog, and have a game plan that stars before you even leave the house – know how you plan to mitigate the risks for them and what you will do if your dog starts showing signs of hypothermia. This is what I do to protect my small dogs for hypothermia in the winter. This helps prevent hypothermia in the first place and can act as a treatment if they start to show mild signs. Bundle them up in a super warm jacket – one that will keep their body core temperature warmer than they would be sitting around at home. Regularly check them both visually and by feeling them. I feel under their coat to make sure their body is toasty warm. Keeping their core warm is important. I also feel their ears, legs, feet, and tail to make sure they don’t feel too cold or stiff or that there is no pain when I touch them (all signs of frostbite). Bring blankets for them to sit in when we stop and rest. Have you seen the size of my backpack? Some people laugh when they see me go for a day hike but I will do anything to keep Chester and Gretel warm and safe. Bring extra layers because, just like with people, layering can be key. I’ve never had to add an extra layer for them because I always dress them just a tad “over prepared” but it doesn’t hurt to bring a thin fleece jacket (like one from Teckelklub) that can be added as a layer under their regular jacket if needed. Bring one of those body warmers to put inside of the blankets if we are taking a long break. The ones I get are self-stick so I can also stick them to the outside of a thick fleece jacket, on top of their spine, and them put their regular jacket on top of it. I rarely use the warmers but I like to have one or two in case they get too cold and I need to slowly warm their body. Bring a warm drink for them in an insulated Hydroflask bottle. Just like I appreciate a cup of hot cocoa on a cold day to warm my belly, my dogs appreciate a warm drink too. I either bring Honest Kitchen Bone Broth or K9-Power GoDog. Note: The trails we hike around Seattle usually see a lot of traffic. Still, we always carry our DeLorme InReach Explorer Satellite Communicator that has an emergency locator function (press a button to sent coordinates to 911/search and rescue). Their expensive, and a bit overkill on a day hike, but we own one and pay for the service so we figure why not bring it. 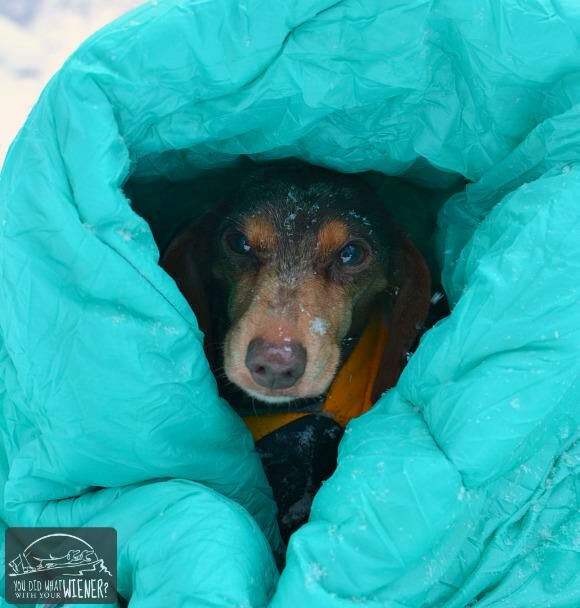 A reader pointed out that in her area, where hypothermia deaths are not common, it’s recommended that you always bring something to protect yourself from the elements if you or y our dog were injured enough that you had to stay the night out there. 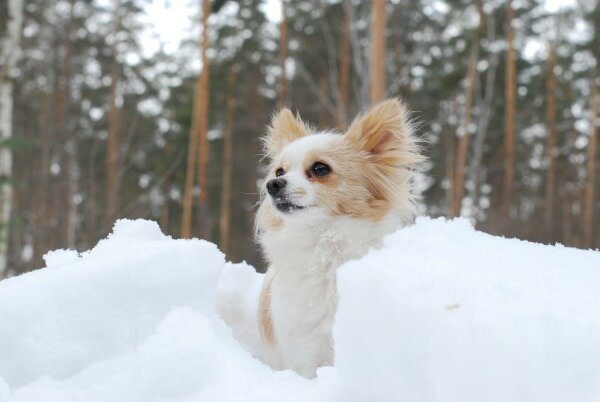 What Do I Do If I Think My Dog Has Hypothermia? Accidents do happen. What if your dog starts showing signs of hypothermia? What can you do? Like I said, I can see Chester and Gretel shivering several times when out on our snowy hikes. Mild shivering is not a big deal. It usually stops once they get hiking again. I’ve been known to slowly walk them in circles on our breaks to prevent them from cooling down too much. If the break will be long, I get out the blankets for them to snuggle in. Sometimes I think it’s too cold for them and insist that they go into the blankets. They insist that they don’t want too. Fair enough. I just make sure they know they have the option and let them make their own decisions while still keeping a watchful eye on them. If they started to show symptoms of hypothermia though, the first thing I would do is to add that second thin jacket or any extra layers I brought. The second thing I would do is pack up and head back to the car. The nice thing about small dogs is that they can be carried so I would do these things while I was carrying them out. They should start warming up on the way out, and even more once you get back to the car and can turn the heater on. Still, you should head to the nearest veterinarian to seek medical treatment. For severe hypothermia, invasive core warming will be necessary, such as the administration of warm water enemas and warm intravenous (IV) fluids. Further essential treatments, especially for severe hypothermia, include breathing aids, such as oxygen, which may be administered with a face mask, and IV fluids for blood volume support. 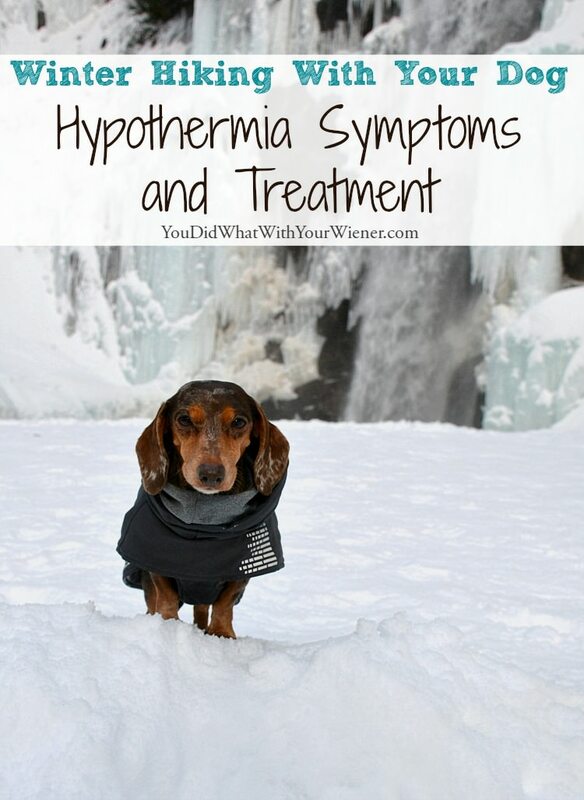 A pawsome comprehensive article on hypothermia. Thank you for writing about this very serious condition. One of the recurring themes in winter hiking conversations in my area (where we average one or two hiker deaths a year due to exposure and hypothermia) is the need to plan for what happens if you get injured or otherwise pinned down out there. Very smart to bring the blankets! The recommendations in our area (where it does get colder, so of course mileage varies) include a sleeping bag and some form of emergency shelter. I’m looking at adding an ultralight four-season tent since I have two big dogs, but there are some nice, inexpensive, lightweight emergency bivy bags that could be (have been) game-changers in an emergency. Great post! It’s so important to recognize the signs of hypothermia! We had a mild scare back in the spring with Phoenix from swimming in the cold river! Luckily we recognized what was happening and we were able to get her warmed up. She ended up being fine but I won’t ever let her swim again until Summer time. I remember that! How scary. I’m not sure I would have thought of that. Then again, my dogs don’t like being in the water 🙂 Glad everything turned out ok.
Great post! We’re moving this spring;/summer and having this info will come in handy. How exciting! Where are you moving to? Since this “info will come in handy”, I’m thinking someplace cold? This is a subject that I needed to read about. We do get some crisp temps here, but they never last long. My dogs and I have never hiked in snow, or somewhere where the temps remain in the range you mentioned for very long. It is my intention to do some cold weather hiking in the future so this is info that is very useful for me to know and I don’t think many folks think about it. Thanks for sharing this info! We just spent the weekend in a mountain town and it was 10-15 degrees during the day. Chester and Gretel did ok for at least 10 minutes…. longer if it was closer to 10 degrees and shorter if it was closer to 5). But then one or both dogs would stop walking and hold up their paw. I think you saw my post about dog boots. They definitely could have used some there (wouldn’t want frostbite). If they were moving though, I don’t think I would have worried about hypothermia. I’m glad to know the signs though and what to do. The condition is sneaky and it can happen when you least expect it. It doesn’t always happen at the coldest temperatures. I’ve seen cases where a person got hypothermia with it was 40 degrees.